The Players Championship (22) took place in Barnsley last Sunday, where the event was taken down by Poland’s Krzysztof Ratajski. To clinch the victory, Ratajski beat two-time world champion Adrian ‘Jackpot’ Lewis 6-4 in the final. The win came after sweeping his matches on Saturday. On Sunday, Ratajski upped his game considerably on Sunday as he faced tougher competition than he came across one day earlier. On Sunday, his 6-4 win over Daryl Gurney was followed by a 6-4 quarter-final victory at the expense of Michael Smith before inflicting defeat by the same scoreline on Kyle Anderson in the semis. In contrast, his opponents on the Saturday were Cameron Menzies, Zoran Lerchbacher and Terry Temple. In the final, both players held throw for the initial four sets before Jackpot provided the slip that would let the Pole in. As Lewis missed three darts at double top that would have otherwise given him a break of throw, Ratajski moved in for the kill, punishing the sloppy Potter by landing his own double 16. From here, Lewis took out 97 for the following set only to see his opponent hit double 16 once more to go 4-3 ahead. Lewis leveled immediately after Ratajski landed his favourite double 16 to move within a leg of victory, before hitting the same double to clinch the title. This October 25 through 28, the Darts European Championship will take place at Dortmund’s Westfalenhalle in Germany. This means that four-time defending champion Michael van Gerwen will head up a 32-player field that also includes Mensur Suljovic, Peter Wright, Rob Cross, Michael Smith, Dave Chisnall and Daryl Gurney. Gary Anderson is the notable absentee after he opted against competing in this year’s European Tour. The 11th staging of the event will be televised live on ITV 4 and, again, Mighty Mike will be the red hot favourite to win it for what will be the fifth time in a row. Betway’s price on the imperial Dutchman and world number one to come away with the title is 4/5. The same online bookmaker values Mensur Suljovic at 15/2, while Peter Wright has a best price of 9/1 on his head. For those that fancy Rob Cross, you can pick up the 12’s on his head or go further down the line and opt for Michael ‘Bully Boy’ Smith and jump on the 18/1 price Betway is offering. Daryl Gurney is available at 22/1, James Wade 25/1 and Adrian Lewis 33/1, but I personally wouldn’t look past the top two favourites here. Let’s select either MVG as the obvious inevitable winner or Gentle Mensur to make things a little bit more interesting. Another week, another tournament, another win for Michael van Gerwen. This time Mighty Mike produced a tantalising display in the European Darts Trophy final where he comfortably saw off the challenge from James ‘The Machine’ Wade. The game was a repeat of this year’s European Darts Grand Prix final in Sindelfingen which lead to the same result. The world number one, whose latest win was his 18th individual title of the season, chucked an average of 111.27 as he ran out the 8-3 winner, closing with a 170 checkout at the Lokhalle. The Dutchman also managed to land another two 100+ checkouts, five 180s while also hitting eight of his 13 attempts at doubles to put Wade firmly in his place. 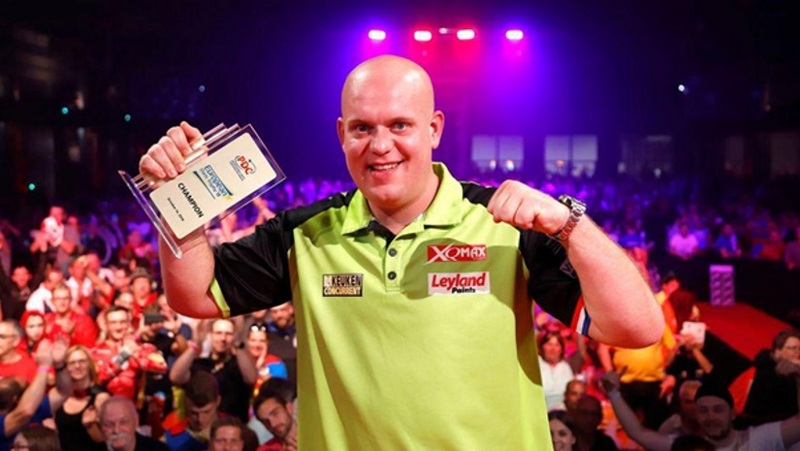 During the weekend, MVG averaged over 100 in Gottingen, as he scooped his eighth European Tour title of the year so far. In total, he played five games starting with a 6-2 win over fellow Dutchman Vincent van der Voort. He followed this up with 6-4 victory over Stephen Bunting when he hit another five 180s during the Sunday afternoon session. MGV then kicked the evening games with a 106.53, 6-2 win over Daryl ‘Superchin’ Gurney. From there, he moved on to Michael ‘Bully Boy’ Smith, who was seen off in a 7-2 win in the semi-finals. Mighty Mike’s opponent in the final, James Wade, was appearing in his fourth PDC final of the season and his second on the European Tour. On his way there, he beat Toni Alcinas 6-4, Darren Webster 6-3, Rob Cross 6-3 and Richard North 7-4 in the semi-finals. It’s a quiet weekend for the big names as they look forward to next week’s European Darts Championship , which takes place at the Westfalenhalle in Dortmund, Germany. We will take a deeper look at the event next week but early prices on an outright win are already up. Michael van Gerwen, 8/11, is the odds-on favourite, followed in the betting somewhat surprisingly by Mensur Suljovic who is priced at 8/1. Peter Wright is third in the betting also at 8/1, ahead of Rob Cross at 11’s, Michael Smith at 18/1 and Daryl Gurney at 22/1. All of the above prices are available at the online bookmakers Betway. Michael van Gerwen is the new World Grand Prix champion after beating Peter Wright in the final at the CityWest Hotel in Dublin on Saturday. The world number one was too much for Snakebite and stamped his superiority on the PDC’s unique double-start major, an event he has won five times in the past seven years. This was also his 17th tournament success of the season thus far, which includes victories during the Darts Premier League and Darts Masters. Incredibly, Mighty Mike dropped just two sets on the way to the final, where he lost only two more to Wright in a 5-2 victory. In the final, MVG banked his lowest average of the week — 88.45 — compared to world number two Peter Wright’s 91.61. 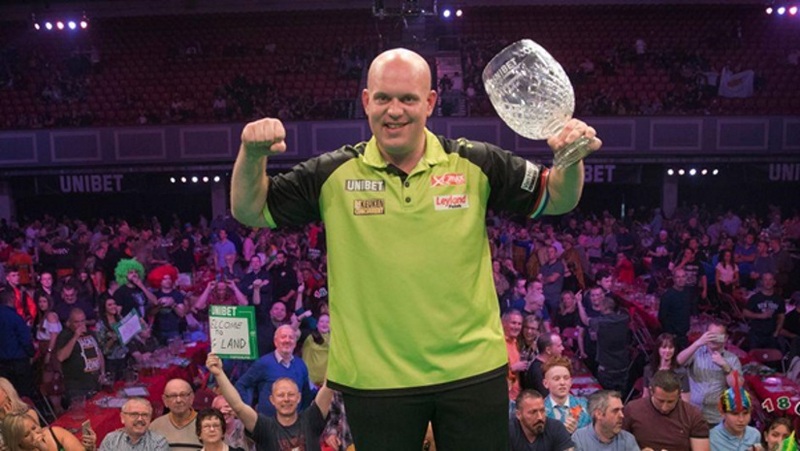 MVG also scored two crucial ton-plus finishes and landed seven 180s during the match, while his opponent hit six maximums and duel checkout highs of 101. With the match level at 2-2, the popular Peter Wright — who was appearing in his first Dublin final — looked to be the player in control of the fifth leg. It didn’t last long as he squandered his opportunity, something that you simply cannot do when van Gerwen is your opponent. With that, the Dutchman took his chance and won the pivotal leg with a stunning 101 checkout. He followed this up by winning the following two sets to claim yet another trophy. On route to the final, Mighty Mike had seen off Steve Lennon, Darren Webster, Dave Chisnall and last year’s winner, Daryl Gurney, 4-1 in the semi-finals. It was Gurney who knocked out the in-form Gary Anderson 3-0. On the other hand, MVG’s opponent Peter Wright successfully navigated tricky ties against Mensur Suljovic in the semi-finals as well as Jermaine Wattimena, James Wilson and Steve West. Surpisingly, the world champion Rob Cross flew out at the first handle when he lost 2-0 to Steve Beaton. After all the spent efforts of the World Grand Prix, the game’s leading names return to the European Tour on Friday when the thirteenth event of the series gets underway at the Lokhalle Arena in Gottingen, Germany. This is only the second staging of the European Darts Trophy and it won’t surprise anyone to learn that Michael van Gerwen was the victor. He will be back to defend the trophy he won a year ago when he beat Rob Cross 6-4 in the final. Others will be looking to follow Cross’ lead by using these autumn events to build up some momentum for the World Championships in December. One player not following his example, however, is Gary Anderson, who has decided to sit this event out due to a hectic winter schedule. Given that he looks like the only player on the circuit capable of giving MVG a scare, you can see why Betway have Mighty Mike down as the red-hot favourite at 8/11. In total, a field of 48 will be heading to Gottingen including last weekend’s beaten finalist Peter Wright. On form, as last week showed he might be, he can be a factor here, which is represented in the betting lines — second at a handsome 6/1. Rob Cross, who is having a horrible year, is fancied at 9’s and will be desperately hoping to repeat his late-in-the-year form from last year especially given that the Ally Pally is creeping into sight. Another player I keep saying to look out for is Mensur Suljovic. The Australian is hitting some great darts right now and usually enjoys the European games. Betway have priced The Gentle at 12/1. Finally, it’s worth noting some prices on the outsiders, especially given that Gerwyn Price, Simon Whitlock, Ricky Evans and Mark Wilson have all made European Tour finals this season. Daryl Gurney’s recent upswing in form sees him priced at 33/1, while Gerwyn ‘Superchin’ Price (66/1) Michael ‘Bully Boy’ Smith (20/1), Adrian ‘Jackpot’ Lewis (28/1), and Simon ‘The Wizard’ Whitlock (66/1) are all capable of winning these Euro Tour events.